Intussusception is a serious medical emergency which results from the obstruction of the intestine, due to which food or fluid cannot pass through the intestine. In this condition, blood supply to the affected portion of the intestine gets cut off and causes perforation (a tear in the bowel), infection and loss of bowel tissue. The intestinal obstruction which marks the occurrence of Intussusception can be described as the telescoping (infolding or sliding) of a portion of the intestine within an adjacent portion. This condition mostly affects children aged between 3 months and 3 years it rarely affects children under 3 months, older children or adults. The condition can prove to be fatal if it is not treated in time. In Intussusception, the telescoping of the intestine (usually the small intestine) results from an abnormal growth (a polyp or a tumor) in the intestine. The abnormal growth, called lead point, is grabbed by the normal wave-like contractions of the intestine; and the lead point, along with the inside layer of the intestine, gets pulled into the bowel ahead of it. In most cases of Intussusception, the exact cause of the condition cannot be identified. However, most of the children affected by Intussusception generally develop the condition after a recent attack of gastroenteritis or stomach flu. The Family history of Intussusception. In the affected children, the most common symptom of the occurrence of Intussusception is an acute abdominal pain because of which they may suddenly start crying loudly and pull their knees to their chests. The episodes of abdominal pain mostly occur after every 15-20 minutes. However, as time passes, the painful episodes occur more frequently and also last much longer. Bloody stools; or stools mixed with mucus. 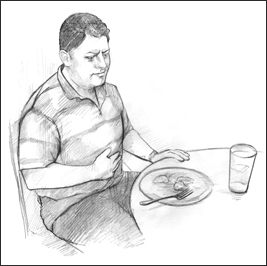 In rare cases when adults are affected, the symptoms of Intussusception generally overlap with the symptoms of some other conditions and are thus difficult to identify. Nonetheless, the most common symptom of Intussusception in adults also is abdominal pain which comes and goes, along with vomiting and nausea. 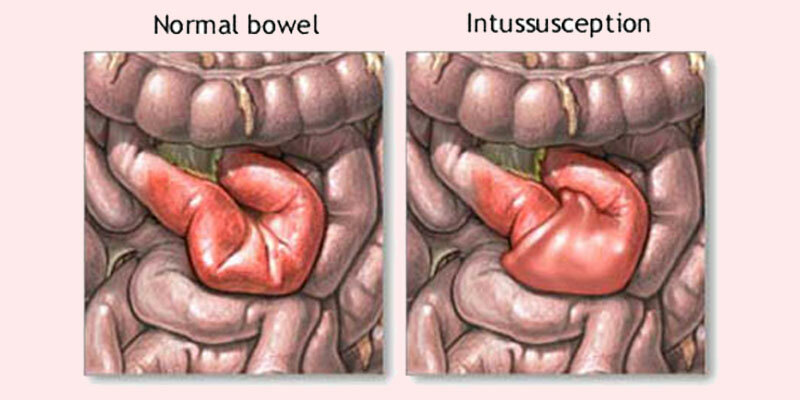 Intussusception is a condition which requires emergency medical care. When the doctors suspect that a child is suffering from Intussusception, they immediately send the child to the emergency room, where the intestinal blockages are spotted with the help of X-ray or an abdominal ultrasound. If damage to intestines is identified, the child is taken to the operating theatre straightaway to correct the bowel obstruction.Generally, two types of enemas an air enema or a barium enema are helpful in diagnosing as well as treating Intussusception in serious cases. These capsules are prepared from a combination of some potent herbs which have the ability to enhance the health of the digestive system. 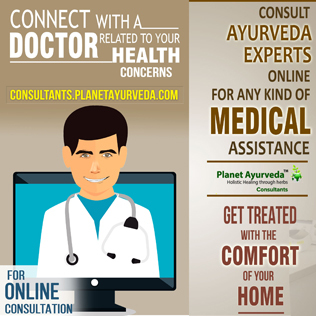 These herbs, widely known for their beneficial properties, include Amla (Emblica officinalis), Haritaki (Terminalia chebula), Pippali (Piper longum), Jeerak (Cymium cumium), Sounf (Foeniculum vulgare), Dhania (Coriander sativum), and Bahera (Terminalia bellerica). 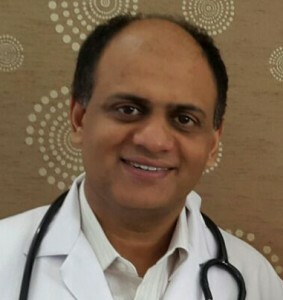 The use of Digestion Support capsules is beneficial in managing Intussusception because they are helpful in maintaining the natural PH of the stomach, supporting the digestive process, improving appetite, maintaining proper metabolism of the body, boosting the immune system, rejuvenating the body, and balancing the body’s three doshas – Vata, Pitta and Kapha doshas. Dosage of Digestion Support capsules for managing Intussusception: One capsule twice a day, with plain water, after meals. For the preparation of these tablets, some well-known herbs and other natural ingredients with immense medicinal value are used. 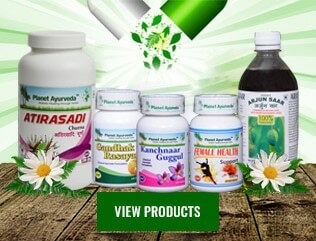 These herbal components with proven appetizer, digestive, analgesic, and antipyretic properties — include: Pippali (Piper longum),Chitraka (Plumbago zeylanica), Danti (Baliospermum montanum), Yavkshar (Potassium Carbonate), Sarjakshar(Sodium Carbonate), Shudh Parad(Purified Mercury), and Shudh Tankan(Purified Sodium Biborate). These tablets have the capability to alleviate intestinal pains, maintain the health of digestive organs, relieve gastritis, manage digestion-related disorders, improve appetite, reduce inflammation, and maintain the balance of Vata, Pitta and Kapha doshas of the body. Dosage of Mahasankh Vati tablets for managing Intussusception: Two tablets with plain water, two times a day, after meals. Vatsakadi churna is an excellent herbal powder which is very beneficial for managing intestinal disorders, particularly the conditions associated with excessive diarrhoea and dysentery. This churna can manage flatulence, gas and irregular digestion, and can also treat irritable bowel syndrome, unexplained intermittent diarrhoea, Crohn’s disease, and Ulcerative colitis. The herbs used for preparing this churna include: Saunf(Foeniculum vulgare), Bilv(Aegle marmelos), Dhania(Coriander sativum), Anar (Punica granatum), Chhoti Elaichi (Elletaria cardamomum), and Jaiphal(Myristica fragrans). For managing Intussusception, it is beneficial to mix Vatsakadi churna with Vara churna (also called Triphala powder), which is another amazing herbal powder for treating several digestion-related conditions. Vara churna is prepared from three potent, multipurpose herbs Amalaki (Emblica officinalis), Haritaki (Terminalia chebula), and Bhibhitaki (Terminalia ballerica). These herbs have the ability to eliminate toxins from the body, treat constipation, provide colon cleanse benefits, treat vision problems, reduce high cholesterol, and treat some other common conditions like acidity, migraine, obesity, and general weakness. Dosage of Vatsakadi churna mixed with Vara churna for managing Intussusception: 1-2 teaspoons daily, with water, after meals. 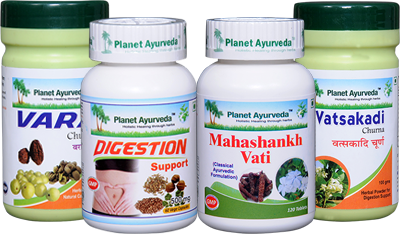 Planet Ayurveda’s herbal products for Intussusception are completely safe to use. These products are pure vegetarian formulations, which do not contain any chemicals, preservatives, starch, yeast, colors, binders, fillers, or additives.